JEGS 32033 - Heat Shield Mat 12" x 24"
DEI 010461 - Reflect-A-Cool 12" x 24"
DEI 010462 - Reflect-A-Cool 24" x 24"
Adhesive backed heat barrier protects parts and components from radiant heat. Highly reflective surface is capable of withstanding radiant temperatures in excess of 2000°F. Woven, flexible material can easily be applied to any surface or wrapped around a hose or wire. 13575 is rated 4.2 out of 5 by 5. Rated 5 out of 5 by Poppa Lynn from Protect your battery from header heat I use this product to extend the life of my '66 Corvette battery as it sits in close proximity to the exhaust header. Easy to cut and apply and it stays stuck for years...good product. 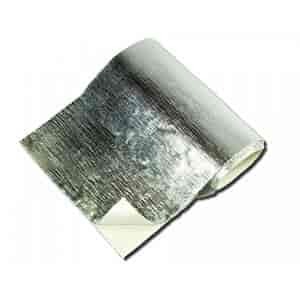 Rated 5 out of 5 by RF71 from Great quality Great heat insulator. Used it to protect the plastic body panels near the exhaust on a Polaris RZR. Super strong adhesive and trims easy. Rated 3 out of 5 by EddD from Great style and appearance Item is too small 12"x24" and too costly to do much with. What temperature is the adhesive rated for? Will it stick to a steel wall that gets up to 430 degrees? This will need some supplemental fasteners to hold it in place. The silver side of this is rated for 2000 degrees, but the back isn't rated for anything over 200. If I were to install this inside my car, say on the roof, and inner doors, the silver metallic side would face inward. how would that block outside radiant heat? The silver part of the insulation mat needs to face the heat source to be effective.